Some situations ask for large quantities of coffee. This may affect the quality, unless you opt for a round filter machine from Sammic B series, manufactured by Bravilor Bonamat. This machine is ideal for peak moments, such as the interval in the theatre or the coffee supply in the hospital. Quickly and easily large quantities of coffee, brewed in convenient, moveable containers that enable you to serve coffee at any moment and at any place you want. • Delicious, fresh filter coffee. • Stainless steel filter pan and housing for a robust and high quality look. • Option: cups, decanters, litters or gallons. • Total and day counters. • Adjustable brewing time for optimum extraction. • Maximum safety: container and swivel arm safety. If you need a large quantity of fresh filter coffee brewed in a relatively short time, the round filter machines of Bravilor Bonamat are the solution. The B-series includes four models with volumes of 5, 10, 20 and 40 litres and each model is availabe in single or two containers version. Within these volumes any required quantity of coffee can be easily made. The machines have very user-friendly programming and the design is really worth looking at too: the robust stainless steel look endorses the quality of the machine.The machines have a built-in timer, so you don’t have to be present when the coffee is being brewed. 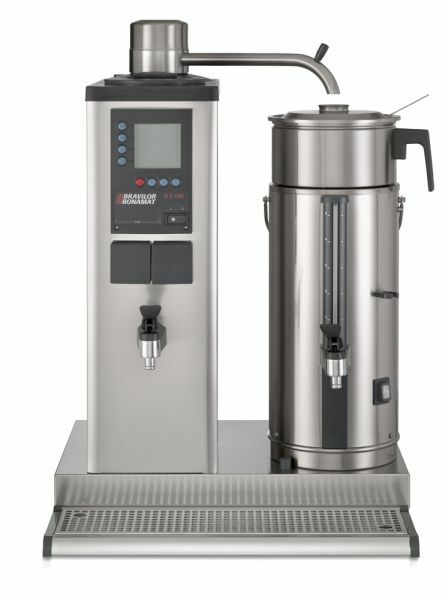 B-HW series: coffe machines and hot watter. Do you also need hot water in addition to coffee? Then opt for the B HW-series. These machines have separate hot water taps for, for instance, very easily making tea. This series includes three types: 5, 10 and 20 litres. By default, the B (HW)-series consists of a column and two containers, but the machines are also available in single models with one container on the left or the right and a column. This allows for easy compilation of, for example, double or triple machines to make even larger quantities of coffee. There are several models that have been adapted to various situations. With these large machines safety is important. Built-in safety devices make sure that no coffee is brewed when there is no container below the outlet or when the outlet has not been placed above the container. Within these volumes any required quantity of coffee can be easily made!